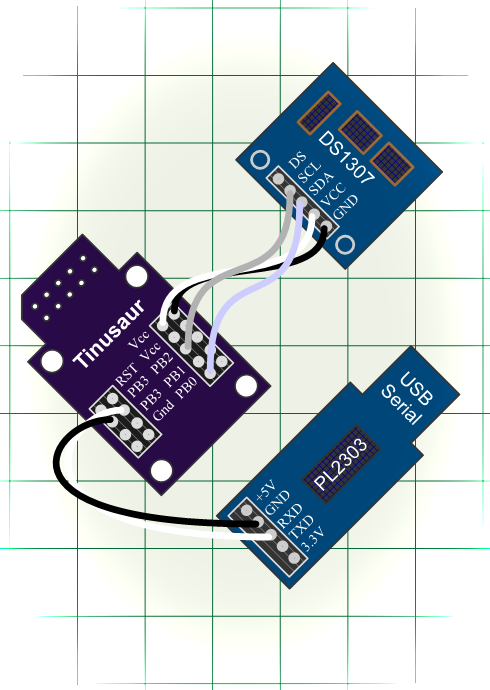 Working with the DS1307 Serial Real-Time Clock using the USITWIX library for I2C / TWI on Atmel ATtiny85 / Tinusaur. Let’s see how can we work with the DS1307 serial real-time clock using the USITWIX library for I2C / TWI on Atmel ATtiny85 / Tinusaur. Bellow is the testing setup. 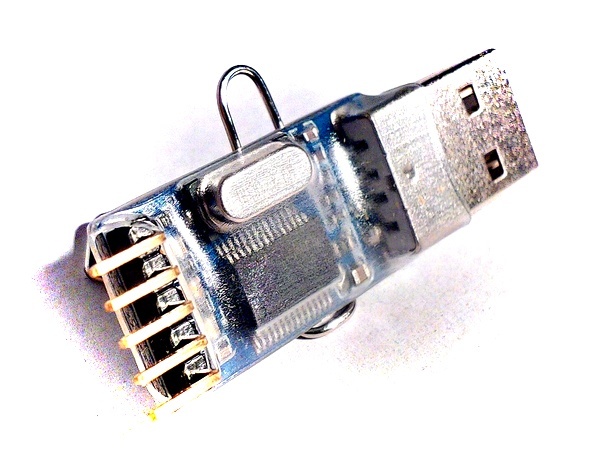 NOTE: We need the USB-to-Serial just for debugging – it isn’t essential part of the setup. There is no library yet to do that but with in the testing code there are few functions that could do the job. uint8_t ds1307_read_reg8(uint8_t reg_addr) – reads one byte of data from the specified register. uint8_t ds1307_write_reg8(uint8_t reg_addr, uint8_t reg_data) – write one byte of data to the specified register. uint8_t ds1307_init(void) – initializes the circuit by writing specific data into the registers. uint8_t ds1307_setdatetime(uint16_t year, uint8_t month, uint8_t date, uint8_t weekday, uint8_t hour, uint8_t min, uint8_t sec) – sets date and time. uint8_t ds1307_adjust(void) – this is helper function – it sets the date & time to a specific value – let’s not forget that a brand new circuit does not have correct date and time set. There are 2 additional functions that are used to convert data byte to and from BCD format. 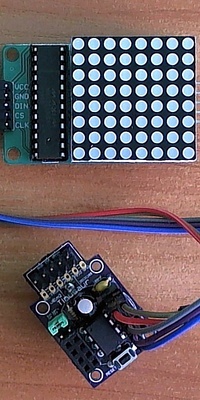 In our previous post “USITWIX – Using UART as TWI / I2C” we looked at the USITWIX library that implements TWI / I2C communication between а ATtiny85 micro-controller and peripherals. Let’s see now how we can use that library to work with the BOSCH BMP180 atmospheric pressure sensor and a ATtiny85/Tinusaur boards. So, we wrote a simple library (called it BMP180tiny) that uses USITWIX to read and write from/to BMP180 registers, retrieve the measurements, do some additional calculations and produce result suitable for use in an application. The source code is available at https://bitbucket.org/tinusaur/bmp180tiny. — The library is in the “bmp180tiny” folder. 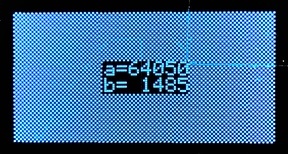 — A sample code could found in the “bmp180tiny_test1” folder. The page about BMP180tiny and articles about BMP180tiny. 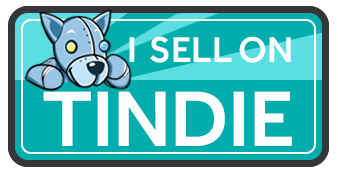 The page about USITWIX and articles about USITWIX. As we know, there’s no I²C on ATtiny85, not even the TWI (Two Wire Interface, which is basically I2C with a different name) that some other Atmel chips have, so I had to write my own that takes advantage on the built-in USI unit. This library is called USITWIX and will be presented in this blog post. Of course, I used other people’s work write mine and they’re references in the source code. The primary source is the Atmel application note AVR312: Using the USI module as a I2C slave that explains how to use the built-in USI unit as I2C slave. The source code is already available at https://bitbucket.org/tinusaur/usitwix. Although the TWI and I2C is a synchronous communication protocol it still requires precise timing. These may need to be adjusted if the CPU runs at a frequency different than default 1 MHz. 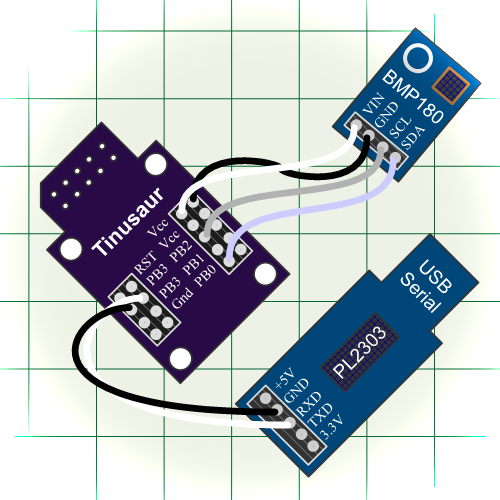 The BMP180TINY is another library for working with the BOSCH BMP180 atmospheric pressure sensor.The source code is available at https://bitbucket.org/tinusaur/bmp180tiny along with some samples. There is also a Variometer project that uses those libraries to produce audible measurements of the changes in the altitude by measuring the atmospheric pressure and taking into account the temperature. 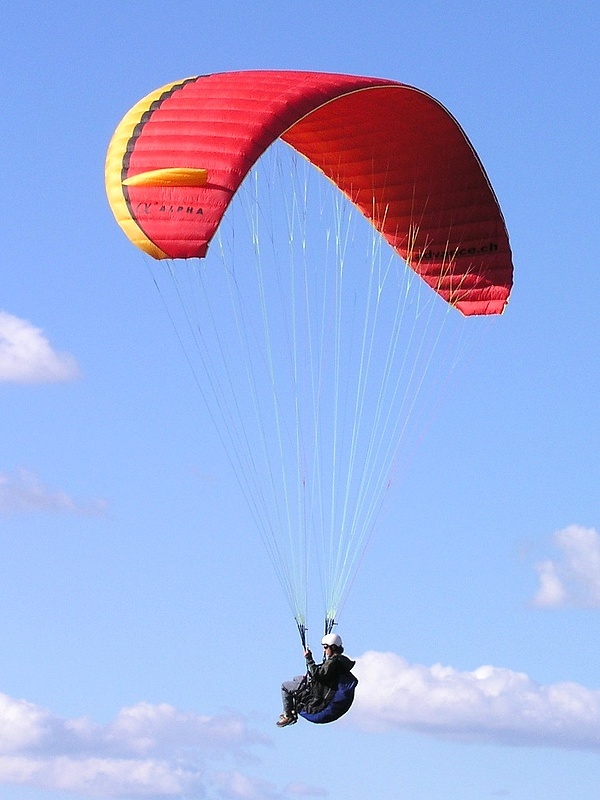 Such tools, or instruments, are often used by paragliders. Here are some references to sources that I used while working on this project. C-code driver for TWI slave, with transmit and receive buffers; Compatible with I2C protocol; Interrupt driven, detection and transmission/reception; Wake up from all sleep mode, including Power Down. What’s wrong with the AVR Appnote? 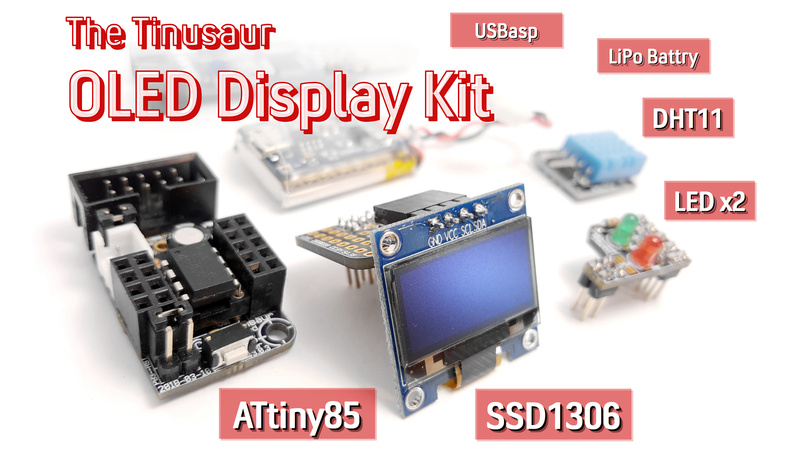 ATTiny USI I2C Introduction – A powerful, fast, and convenient communication interface for your ATTiny projects! I2C, it’s a standard that’s been around for around 20 years and has found uses in nearly every corner of the electronics universe. It’s an incredibly useful technology for us microcontroller hobbyists but can seem daunting for new users. This tutorial will solve that problem, first by reviewing what I2C is and how it works, then by going in-depth on how to implement I2C in Atmel’s ATTiny USI (Universal Serial Interface) hardware. This two wire interface is formally known as the Inter-Integrated Circuit bus, or just the I2C bus and was invented by NXP when it was still Philips Semiconductors. If you’re reading this Instructable then you’ve probably heard of the I2C bus and may even have used it on a PIC or other microcontroller. While conceptually very simple, and supported by hardware resources on the AVRs, software drivers are still necessary to use the I2C bus. Atmel provides Application Notes (see the Resources later in this Instructable), but these are incomplete and don’t show any examples beyond communicating with another AVR device. The MAX7219LED8x8 library uses now simple scheduler to automate the task of outputting the buffer to the LED 8×8 matrix. This is not like a real task scheduler (in a real operating system) but it uses the ATtiny85 microcontroller‘s timer and its interrupt to do certain things on regular intervals. While I was working on some code that uses the MAX7219LED8x8 library I figured out that the task of writing the content of the memory buffer to the MAX7219 could be automated by hooking some code to the ATtiny85 timer. First, the scheduling part that initializes the ATtiny85 timer, starts it and handles the hardware interrupt. Second, the MAX7219LED8x8 library functions for setting/clearing pixels and outputting the buffer that now should work with the scheduler. The scheduler_init function initializes the timer and the scheduler_start starts the timer task to be executed on equal interval defined by the max parameter. The scheduler_userfunc function should be implemented in the application so it could be called on regular intervals. There is not “stop” function at the moment since it was not needed in this particular case. // IMPORTANT: Requires TIMER0_COMPA_vect to be setup. The max7219s_buffer_out function is the one called within the scheduler_userfunc timer handler. Everything else remains the same – we use MAX7219_buffer_set(x, y) to set pixel and MAX7219_buffer_clr(x, y) to clear pixel. What could be improved and optimized: output the buffer only when it is changed. More information is available at the MAX7219LED8x8 library page. The source code of the MAX7219LED8x8 library, the scheduler and everything else is available at https://bitbucket.org/tinusaur/max7219led8x8.